When dapper is how you need to dress and the 1920s is the style you want to choose, Stacy Adams Madison boots can make it happen. The Madison is the classic biscuit style boot that has been around for ever and ever and has a huge following of men who favor that classic 1920s style of dress when it comes to their suit and shoe style. 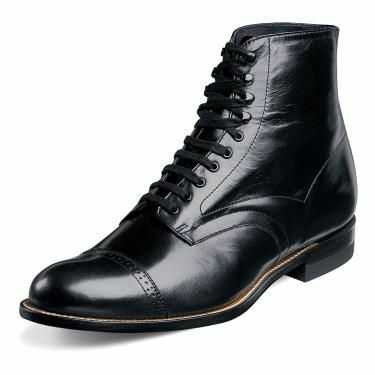 These black Madison boots are the original style and feature supple and shiny kidskin leather uppers with a full leather sole with rubber heel like all Stacy Adams Madison shoes come with.